-Claudia Andujar - ARTE AMAZONIA provides a global voice through art for the indigenous cultures of the Amazon. "Art is a way of living, or life itself... it's a way of expressing oneself in unique manner, a prophecy, a wisdom put forth that usually carries the experience of one's culture. If the art makes others sensitive to the way of life of the Yanomami, I believe that it has served its purpose." Claudia Andujar was born in Neuchâtel, Switzerland, in 1931, and spent her childhood in Romania and Hungary. During World War II, at the age of thirteen, she escaped from Hungary to Austria with her Swiss-born mother. Her father, a Hungarian Jew, was deported to the Nazi concentration camp at Dachau and later died there along with most of her paternal relatives. After a brief period of time in Austria, Ms. Andujar returned to Switzerland, and later immigrated to the United States. In the U.S., she studied humanities at Hunter College in New York City. In 1956, she left the United States and moved to Brazil. A photography project documenting the way of life of the Carajá Indians in Central Brazil led Ms. Andujar to a career in photojournalism. Her work has been published in Life, Look, Fortune, Aperture, Realidde, Setenta, Claudia, and other magazines. In the early 1970s she met a group of Yanomami Indians in the Amazon Basin of Northern Brazil. Intrigued by the way of life of these people, who had had little contact with the outside world, she gave up her career as a photojournalist to embark on an in-depth photographic essay on the Yanomami. The two-year Guggenheim Fellowship she received (under the name of Claudia Love) helped to support this project. During the Fellowship, Ms. Andujar was witness to one of the most significant cultural dislocations to occur in Yanomami history, when the government began construction of a transcontinental highway in Northern Brazil. She observed bulldozers razing Yanomami villages to pave roads for the highway. along with cultural impact brought about by the construction, Ms. Andujar witnessed a devastating measles epidemic, which swept through the southern territory of the Yanomami in 1974. She saw hundreds of people die, and in some cases, observed entire villages of people succumb to the illness. It was because of this suffering that she temporarily suspended her work in photography and helped establish health outposts enabling Yanomami people to receive inoculations and other medical services. During the 1980s, Ms. Andujar witnessed another devastating incursion into Yanomami territory, when thousands of illegal, small-scale gold miners made their way into the Amazon to make their fortunes. By the end of the 1980s, there were 40,000 gold miners in the Brazilian Amazon while the entire Yanomami population numbered just 11,000. During this period the Yanomami faced even more epidemics, most notably malaria. 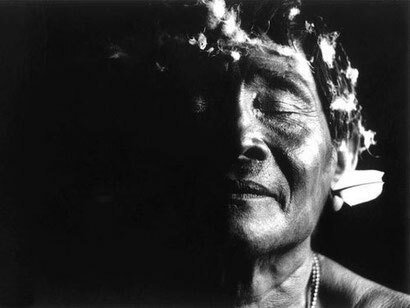 Twenty percent of the Yanomami died in the 1980s as a consequence of the gold-mining intrusion. In addition to the diseases brought by the miners, Ms. Andujar helped document the environmental impact of gold mining in Yanomami lands. Mercury, used by miners to extract gold from ore, spilled into the rivers, poisoning the streams and killing off fish and plant life the indigenous people and other forest inhabitants depended on for food. To bring attention to the plight of the Yanomami, she played a key role in the creation of the Commission for the Creation of the Yanomami Park, the Comissão Pró-Yanomami-CCPY. After a campaign of fifteen years, in 1992, the Brazilian government demarcated more than 96,000 square kilometers of lands, an area the size of Portugal, to be set aside for protection of and use by the Yanomami people. In spite of the demarcation of lands, the period of illegal gold mining continued. Ms. Andujar helped publicize the devastation brought by outsiders, including skirmishes between the Indians and gold miners. In 1993 gold miners took part in a massacre in the village of Hoximu that left sixteen people dead. Of the twenty-two gold miners who participated in the massacre, four were convicted of the crime of genocide. Today, there are still approximately 4,000 illegal gold miners working in Yanomami territory. Ms. Andujar actively monitors the situation and assists the Yanomami in keeping the outside world informed of the miners' activities. Currently, she lived in São Paulo, Brazil and is working to defend the life, the rights and the culture of the Yanomami as a leader of CCPY, Pro-Yanomami.